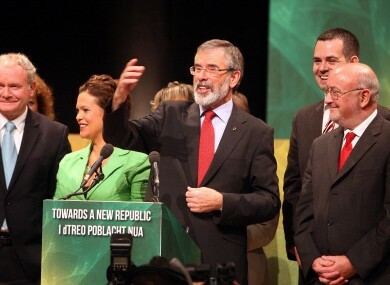 Sinn Féin leader Gerry Adams with parliamentary party colleagues and Martin McGuinnes in Belfast last September. A NEW POLL HAS shown a rise in the support for Sinn Féin at the expense of Fianna Fáil whose support has fallen in recent month according to the survey. The Behaviour and Attitudes opinion poll for today’s Sunday Times shows that Sinn Féin now commands 25 per cent support which is a rise of four percentage points on the last poll and is nine points ahead of Fianna Fáil on 16 per cent, which is down four points. The poll of 914 voters nationwide was carried out between Wednesday, 15 February and Monday, 20 February. It also shows that satisfaction with the government is unchanged from the last poll at 26 per cent, 70 per cent are dissatisfied, while three per cent have no opinion. For the government parties, Fine Gael still comes out on top with 32 per cent support, that’s two percentage points up from the previous poll in December. For the junior coalition partner it is less good news as the Labour Party’s support has fallen to 10 per cent, down one percentage point from the last poll. Independents have 15 per cent of the vote which is unchanged. While the Green Party is on two per cent, down one point from the last poll. For party leaders there is mixed news but all show a drop in support. Satisfaction with Taoiseach Enda Kenny is down three percentage points to 41 per cent, while Tánaiste Eamon Gilmore drops one to 34 per cent. There is a much bigger drop for Fianna Fáil’s Micheál Martin however as he drops seven percentage points to 33 per cent. Sinn Féin’s Gerry Adams is down two to 46 per cent, he has the highest rating of any leader. The Green Party’s Eamon Ryan is on 25 per cent, down five points from the last poll. The poll also shows that 82 per cent of people said they have not yet paid the household charge. Just 10 per cent said they have already paid the €100 tax which is due by the end of March while 8 per cent said they don’t know. Email “New poll shows rise in support for Sinn Féin ”. Feedback on “New poll shows rise in support for Sinn Féin ”.